GE Industrial Full voltage non-reversing IEC contactor has coil voltage rating of 120-Volt AC at 60-Hz/110-Volt AC at 50-Hz and current rating of 13.8-Amps at 460-Volts. 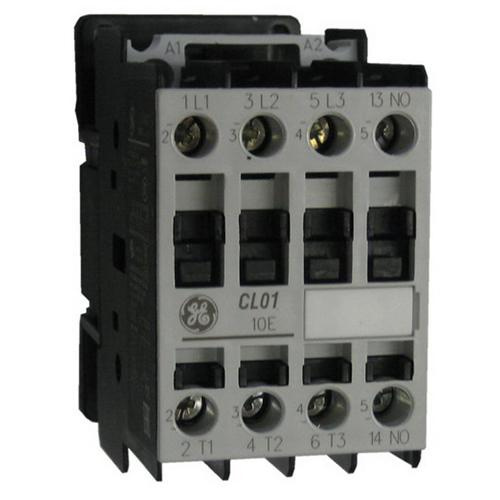 This 3-Pole contactor accommodates size 14 - 10-AWG wire and supports 35-mm DIN rail/screw mounting. It has finger and back of hands protection for greater safety. This AC/DC controlled contactor has power rating of 0.75 hp at 115-Volts, 2 hp at 230-Volts for 1-Phase and 3 hp at 200-Volts, 3 hp at 230-Volts, 7.5 hp at 460-Volts, 10 hp at 575-Volts for 3-Phase. It measures 3.19-Inch x 2.65-Inch x 5.77-Inch. Contactor is UL listed and CSA/CE certified.